Sooz came and picked me up to go to Opening Day at Yankee Stadium, we left here around 10am and headed over to her parents to get the train down to the Bronx. Train was empty at that time which was nice, but I wish I had picked up a cup of coffee. We get down to the Bronx, grabbed some grub and stopped to say hi to some friends before heading in. Oddly enough, we took no pictures with anyone which is not uncommon between me and Sooz. 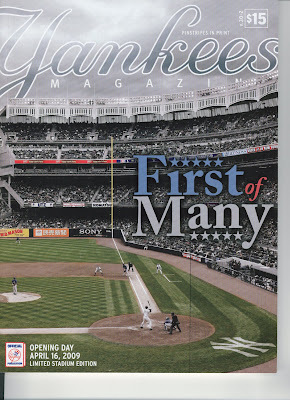 I enjoyed the Opening Ceremony, and the Yankees Museum which I hadn't seen before either. We picked up Opening Day Programs once we got inside, and they were limited editions to just yesterday. We were given a free Opening Day pin as well. Bernie Williams played Take Me Out to the Ball Game on the guitar (and got some ovation). The manager, number 27, Joe Girardi. Number 27. Leading off, the Captain, number 2 Derek Jeter. Number 2. Number 20 Jorge Posada. Number 20. Before we hit the museum we stopped in the Yankees Team Store to look around, and while we we on line waiting for Sooz to pick up a shot glass she saw a sign that said if you buy any two Upper Deck packs you get a commemorative card sheet. So I went and picked up 4 packs of cards, which turned into a nightmare since they weren't in the system. Anyway, we got ripped off just for a big sheet of cardboard that we both needed. 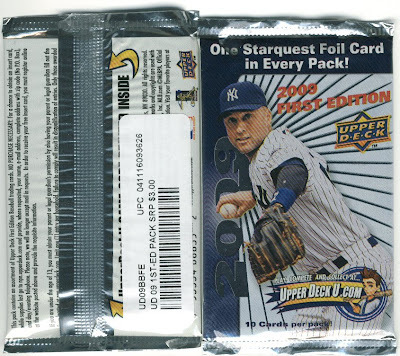 They were selling 09 UD First Edition for $3, and 09 UD Series One for $5 (keep in mind Sooz noticed there was no bar code and there were only 8 cards per pack signifying that these were blaster packs). Thurman Munson's locker from the old Stadium. So Sooz can tell you all about her experience at Yankee Stadium since my opinion hasn't really changed at all. However, my view of the stadium was put into perspective when we left the Bronx and headed to Queens to check out Citi Field and the Mets. Mike Francesa, the YES Network and WFAN sports radio host said it best. If you want a cathedral and a collesium you go to Yankee Stadium, and if you want a ball park you go to Citi FIeld. Citi Field was a night and day difference from the feeling you get at Yankee Stadium. It started off fun from when we were waiting online to buy tickets. We are standing online talking, and we overhear a woman asking people if they want free tickets on the field, and no one said yes for whatever reason. She asked us and we were happy to take them. She was given them for nothing and didn't need them, so we lucked out with what probably were $50 seats. We had planned on buying upper deckers for $23 so that was sweet. We walk in and we are in the Jackie Robinson Rotunda, which was really nice despite him never being a Met. This area was one of the biggest complaints of Mets fans because he wasn't a Met and I think it just added insult to injury becuase we walked the whole stadium and there was nothing about the Mets history, or their players anywhere. I enjoyed this stadium very much, and I guess it tells me that I am a 'ball park' type of person. It was way more fan friendly than Yankee Stadium, there were plenty of places to sit down and eat, or stand up and eat where you didn't have to pay to get in and sit down. There was also the Shake Shack, which very well made my day. Burgers, fries, shakes, etc. and it was delicious. I would seriously go all the way to Queens just for the Shake Shack. Everyone should. World's Fare Market was a small store with drinks, snacks, sushi, sandwiches, etc. The view from our free field level seats. Sure glad we ended up here and not up in the wind tunnel upper deck. The Yankees bullpen should have been called the "Mo Zone". The left field wall, and the Mets retired numbers. I didn't take as many pictures as I could have of Citi Field, mostly because it was freezing and my camera battery was pretty much dead by the end of the night since it wasn't charged. There is a lot more to see there and my pictures don't do this place justice. Very fan friendly atmosphere, and a very different feeling walking in. Maybe it's because I am not a Met's fan and I hated Shea with a passion, or maybe it's just because the park is really that nice. I would recommend everyone see this park if you get the opportunity. I'll leave the rest for Sooz to tell you about. great photos and nice comparisons of the two stadiums. interesting to know how different tw "modern" stadiums can be. sounds like you had a wondeful day ! Nice pictures. Are you sure that wasn't John Fogerty singing "Centerfield" ? lol, John Fogerty, Mellencamp, whatever. Yeah, you are right. As you can see I didn't pay that much attention to his singing other than to take pictures. Great wrap up. I think that the new Mets stadium looks incredible, and I can't wait to check it out. As someone who goes to different baseball stadiums whenever possible, these are a must see the next time I'm in New York. 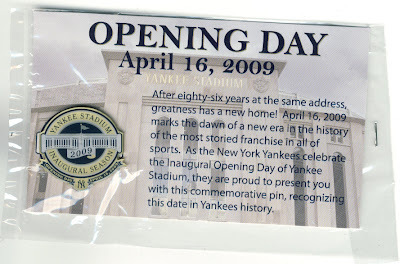 Sadly, I was only able to visit old Yankee Stadium once (happily, it was for the All Star game), and didn't get too much of a chance to explore, but these new stadiums both look like they've got a lot going for them--here's hoping they can stand the test of time.